Sturgeon Fishing has been good to excellent the past few days, we have had a few slow trips but some very nice quality fish. 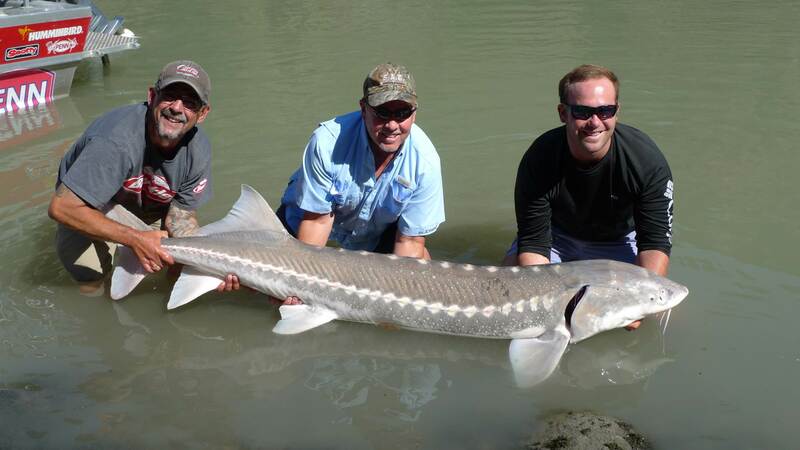 Yesterday we landed 7 fish over 5 ft with a couple over 7ft, our guests from Alberta and Texas had a great trip. Water conditions are very good with 6 to 8 inches of visibility and dropping. 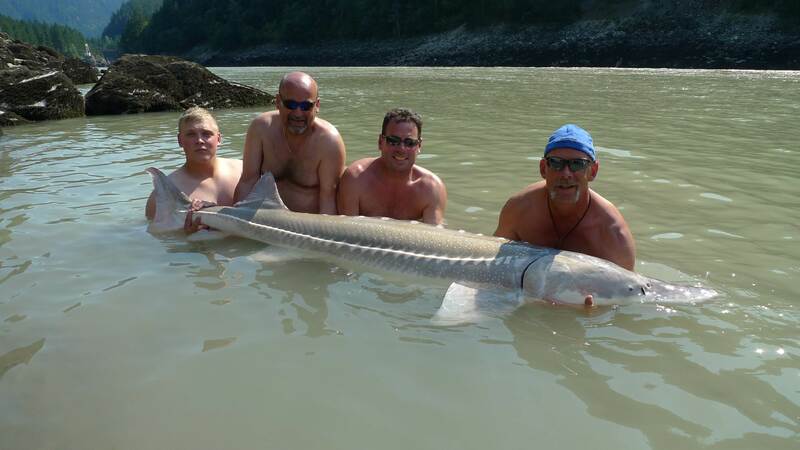 This fish measured 7ft 4 and put up a great battle for our guests from Edmonton. 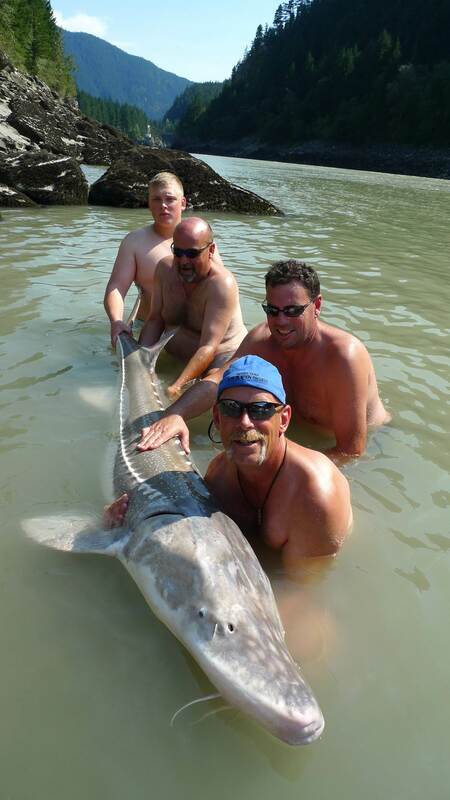 Sturgeon fishing will continue to improve as more salmon enter the Fraser river, we expect the later part of August through to November to be our best fishing of the season. As more sockeye enter the Fraser sturgeon will feed heavily on these fish so if you can get some bellies or other salmon parts, this makes for the best bait. 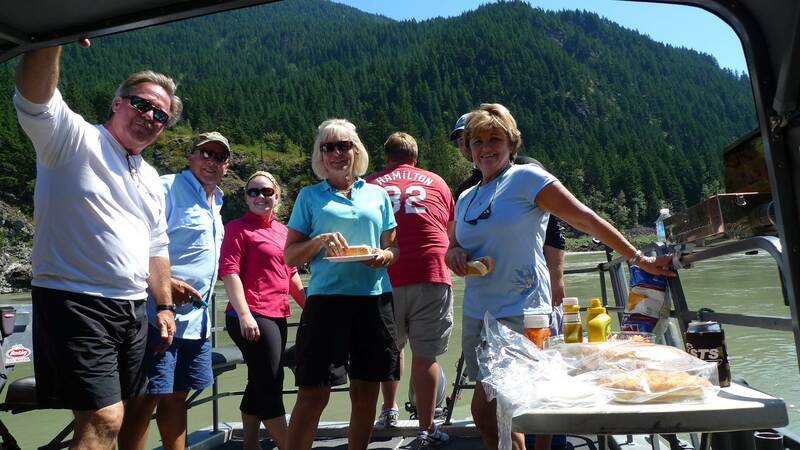 Our guests visiting from Texas had a great day in the canyon, nothing better than fishing, sunshine and a barbeque to fill the tummy. Salmon fishing has been fairly slow on the Fraser although we did manage a few Chinook yesterday Bar fishing around the Harrison River area. Water clarity is good with 6 to 8 inches of visibility and water is still dropping. We are expecting a good push of Chinook over the next few weeks with August 22 being the peak of this run so hopefully we continue to see these great water conditions. Everyone is asking about sockeye, the latest news is that the run has been down sized again due to warm water temperatures so again it is a wait and see. Good news is that there is some great salmon fishing in Vancouver right now so this is your best choice for salmon. We keep our 28ft Kingfisher at the Delta Hotel near the north arm of the Fraser so it only takes minutes to get out to the fishing grounds. Salmon fishing has been fair to excellent in the Vancouver area, yesterday we landed a 28lb Chinook and 5 pink salmon near the North Arm Jetty so it looks as though fish are beginning to stage near the Fraser confluence. It will only be days before all the Pink start moving to the south arm area so action will be fast and furious if you want to catch Pinks. 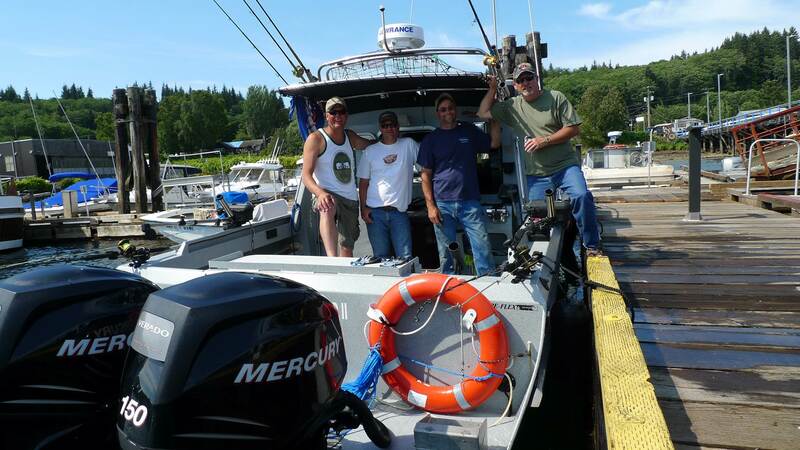 Chinoojk Fishing will also improve as we see the late summer run Chinook arrive so let the fun begin. 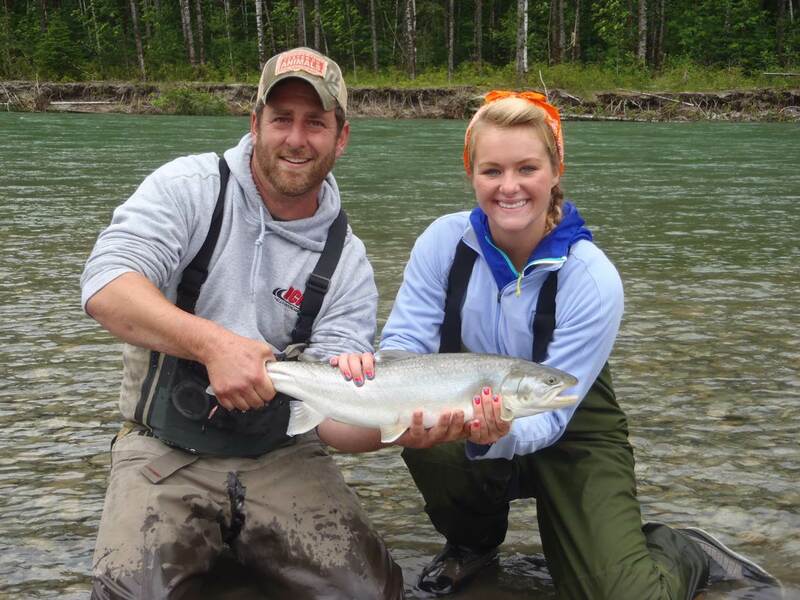 The Pitt River has been fishing well for Bull Trout and salmon, this fishing should continuie for several more weeks until the salmon begin to stage, Fly fishing and spin fishing are both working well, water conditions are perfect . Hells Gate tours are near full , we have an afternoon 2 hour Hope to Sailor Bar tour available for August 24 if you are interested, give us a call or e-mail. 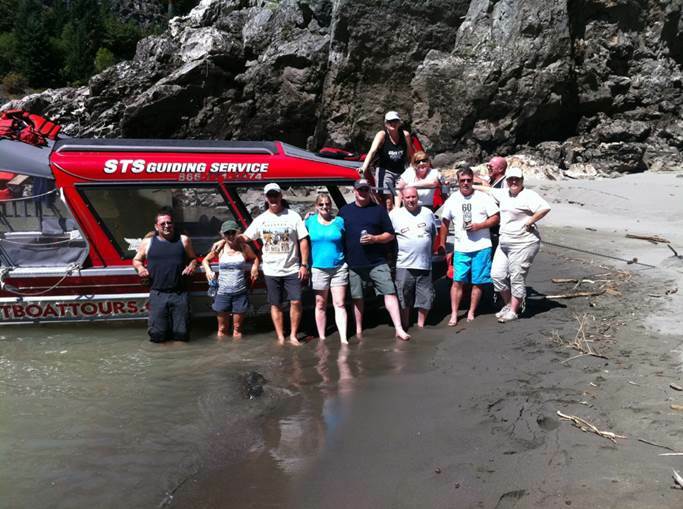 The water is just starting to get big so should be a great trip, cost for this 2 hour tour is $99. My favorite pic of the week. 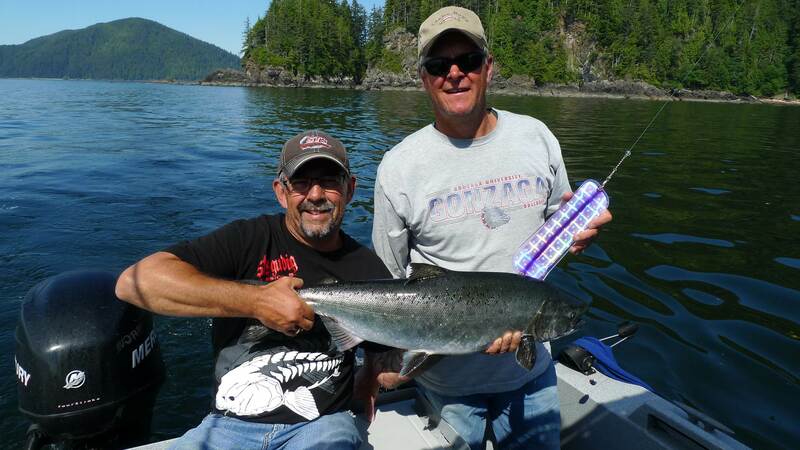 You are currently reading August 11 Fishing Report Update at Hells Gate Jet Boat Tours Blog.